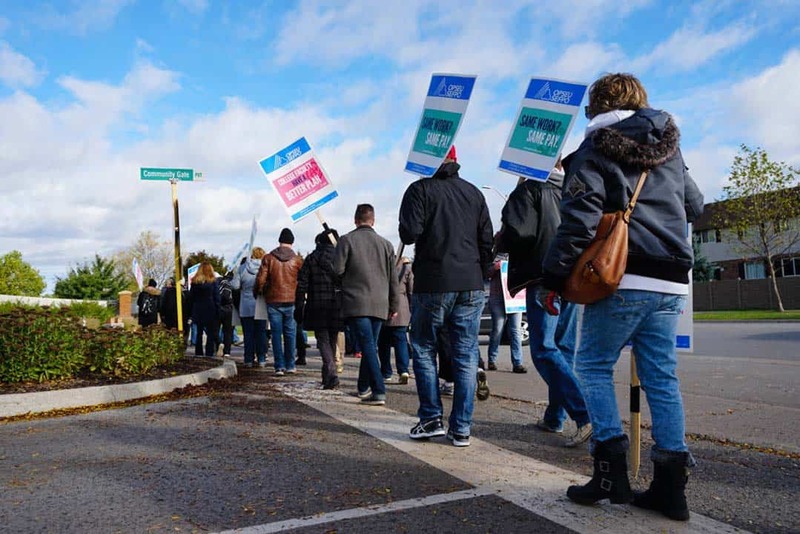 Since October 15, over 12,000 Ontario college professors, instructors, counselors, and librarians have been on strike, demanding academic autonomy and longer contracts. Last weekend, the Ontario legislature passed a bill that will force them back to work on Tuesday, November 21, ending the strike and pushing outstanding issues to a binding mediation-arbitration. MPPs debated in a special weekend sitting of legislature to get the bill through. It passed by a vote of 39 in favour and 18 against, with all Liberal and Progressive Conservative (PC) MPPs present voting for it and all New Democratic Party (NDP) MPPs voting against. The bill would have sent students back to class on Monday, November 20 if it had reached unanimous consent in legislature, but it was blocked by the NDP, with party leader Andrea Horwath claiming, “I want students back in classrooms Monday, and I want that achieved through a deal.” The PC party has supported the back-to-work legislation from the beginning. Classes for students will now resume on Tuesday, November 21. The strike has affected 1,000 students in joint UTM-Sheridan programs and less than half of the 170 in UTSC-Centennial programs.Province-wide, approximately 500,000 students found themselves “caught in the crossfire,” of the strike, said Ontario Public Service Employees Union (OPSEU) President Warren Thomas. Efforts to end the strike diminished when striking faculty members voted overwhelmingly to reject a contract offer by the College Employer Council, which approached the Ontario Labour Relations Board to force a vote — at least 50 per cent plus one vote in favour would have been required to approve the offer. A total of 95 per cent of the 12,841 striking faculty voted, with 86 per cent voting to reject the council’s offer. Thomas called the bill “the worst kind of political theatre,” claiming that it pitted students against faculty. “I am disappointed in the extreme that, even after the College Employer Council extended the strike by two weeks by forcing a vote on its last contract offer, and even after 86 per cent of faculty emphatically rejected that offer, the Premier has put forward a bill that does nothing to hold the colleges responsible for their bad behaviour throughout this process,” said Thomas in a bulletin posted on the OPSEU web site. Meanwhile, legislatures justified the legislative decision by referencing the students affected by the strike. “Students have been in the middle of this strike for too long and it is not fair,” said Ontario Premier Kathleen Wynne in her initial statement proposing the back-to-work legislation. International students have been especially concerned since their fees are significantly higher than domestic ones. Potential extensions for the semester may result in additional rent and other expenses. “The situation is a mess,” said Temiloluwa Dada, a fourth-year international student from Nigeria. He is expected to graduate at the end of the academic year, but his plans may be subject to change, and a study permit renewal will be necessary if his graduation is postponed. Dada still has an internship to complete for his journalism program, which could also be affected by the prolongation of the semester. Elizabeth Oloidi, another fourth-year international student from Nigeria, is concerned about her plans after graduation, which is supposed to take place at the end of this year. Like Dada, she will have to renew her study permit and visa as a result of the elongation of her study period. In addition, she is worried the strike may affect her grades. Both Dada and Oloidi had plans to travel back to their families during the winter break, but now their plane tickets may have to be postponed or cancelled.